Home » A Hypnotic Night in Split. Review of A Wonderful Night In Split (original title Ta divna splitska noć), a 2004 Croatian drama film directed by Arsen Anton Ostojić. A neo-noir set in Split on the eve of the New Year, three inter-locking stories are told, uncovering the seedy and gritty underbelly of the picturesque Croatian tourist town and exploring the painful scars of a frustrated post-war society. 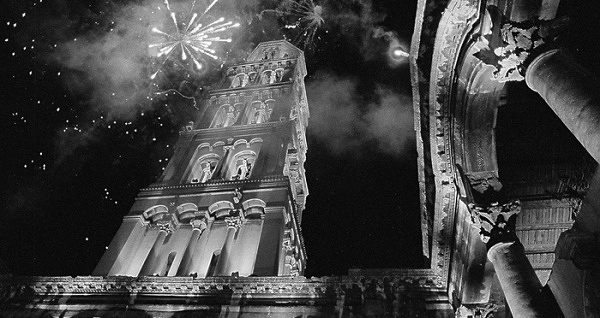 A Wonderful Night In Split is a tale of numerous characters’ last couple of hours on New Years Eve. Despite featuring many characters, the elliptical narrative focuses of three main stories, all with interconnecting characters and themes. The first story is about Mike, a drug pusher and his relationship with a military widow and her son who hates Mike and misses his war hero father; the second story is of Maja, a drug addict who agrees to prostitute herself to an American sailor (who happens to be depressed himself) just so she can score some more heroin; the third and slightly more light-hearted story is of Luka and Vandella, a young couple searching for a place to consummate their relationship. All these sub-plots are connected by the drug dealer Crni and the concert of Dino Dvornik’s (who plays himself) where each character passes through and past each other at some point in the narrative. Mike and his widowed girlfriend. The subject matter of A Wonderful Night In Split is deeply rooted in the darker side of contemporary Croatian reality, stemming from the aftermath of the war. Focusing on dissipated war veterans, drug abuse, young people with little choices and a seeming lack of future prospects and generally a united feeling of hopelessness. Though post-war trauma is one of the major themes of A Wonderful Night In Split, it is not delivered in an obvious or over-sentimental way, and is treated more subtlety, with cues in the mise-en-scene. Generally, the film manages to avoid a hack-handed and sentimental approach to the dark subject matters, and manages to deliver it with dark humour and irony which makes the film fresher and more entertaining. 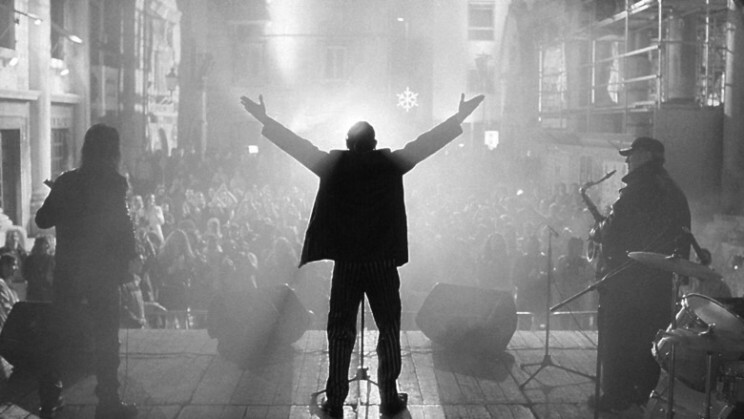 Even more ironic is the title of the film which refers too a traditional Dalmatia song “Ta Divna Splitska Noc”, which we see the old drunk man sing throughout the film however completely reversing the words emphasizing what a un-wonderful night in Split it really is. The style and aesthetics of A Wonderful Night In Split is where film strengths really lie, employing unusual camera work and an innovative, elliptical, non-lineal structure. The overall look of the film is dizzying and hypnotic which is definitely not a criticism. The claustrophobic camera work constantly follows and tracks the characters and the overhead crane shots, showing the maze of buildings and alleys, help convey the feeling of entrapment the characters are suffering. Director Ostojić cuts back and forth in time as he interweaves each story, so that the development for each is shown to occur at or near the stroke of midnight. The use of the diegetic soundtrack from the concert (which adds tremendously to the atmosphere) is a really interesting use of a narrative device portraying the passing and repeating of time. Though the themes of the film and the message of post-war destruction may not be anything new or unexpected in Balkan cinema (or more Western cinema for that matter), Ostojić choice of stylised techniques and dark ironic humour makes A Wonderful Night In Split a wholly fresher and different take on a period that is still very prevalent.